I made myself a bag. I never make myself bags -have you noticed? They are always for other people - Mum, Mother-in-law, sister-in-law, daughter's party guests, daughters' teachers, and you, of course. What I actually do carry around with me is some ratty purse thing bought at a store. It's filled with rubbish - children's snacks, old tissue paper, receipts, bank statements, pens, makeup, one pair of emergency earrings - those sorts of things. Why would I need a beautiful bag for stuff like that? I'd sooner give it or sell it to people who actually deserve it. Unless it was in Orla Kiely fabric. Then I might be persuaded to keep it. After all, my wallet is in Orla. And my ipod pouch is in Orla. Might as well have the set, right? So meet Bella Bag #5. 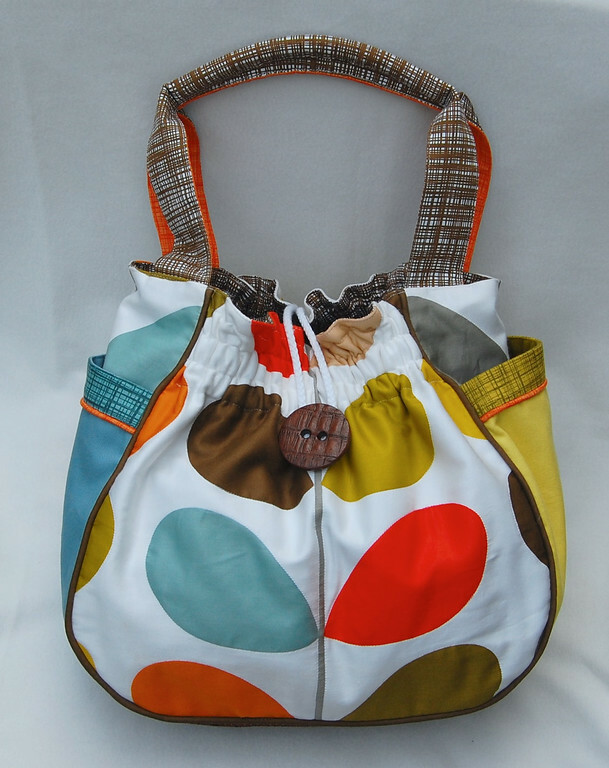 It has 11 different fabrics in it, of which 5 are real Orla's. Like the lining and the straps. and that iconic stem print. It's hard not to recognize that. Can you tell that I really had fun making this bag? Some of you asked me where I got the stem fabric. I wish I could say that I'd discovered a store here in the US that stocked Orla Kiely fabrics (ebay does not count) but no. The real answer is: from my bed. I bought this and cut part of it up. Most expensive single fabric purchase I'd ever made. Don't worry- I didn't touch the comforter (that's still intact and on the bed). I'm not that crazy. The fabric, however, had to be prepped before it was suitable for a bag. It has a gorgeous sheen and tight weave but it was too thin for a bag. So I backed it with twill. Not interfacing (gag) - just twill. And quilted it, but without the puffy batting. See those stitching lines around the motifs? Each piece of fabric I used had to be stitched to its backing piece of twill this way. The prepped fabric was as robust as twill and felt like twill but looked like the original fabric. There's a reason for sharing this technique with you. 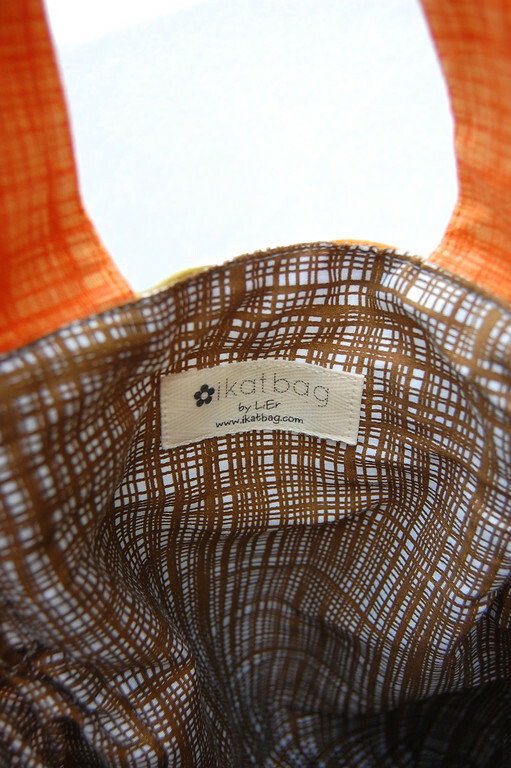 If you've been reading this blog awhile, you might have noticed that I get on my soapbox whenever I can about using the right-weight fabric for bags i.e. home-dec or heavier. I never use quilting cotton, no matter how beautiful because I'd either end up with a flimsy excuse for a tote or something heavily interfaced that still crumples and softens over time and with wear. However, I know I am fighting a losing battle, given the popularity of quilting cotton, so (sigh) if you would still insist on prefer to make bags with quilting cotton, yes, it can be done. Just be willing to quilt it a bit. 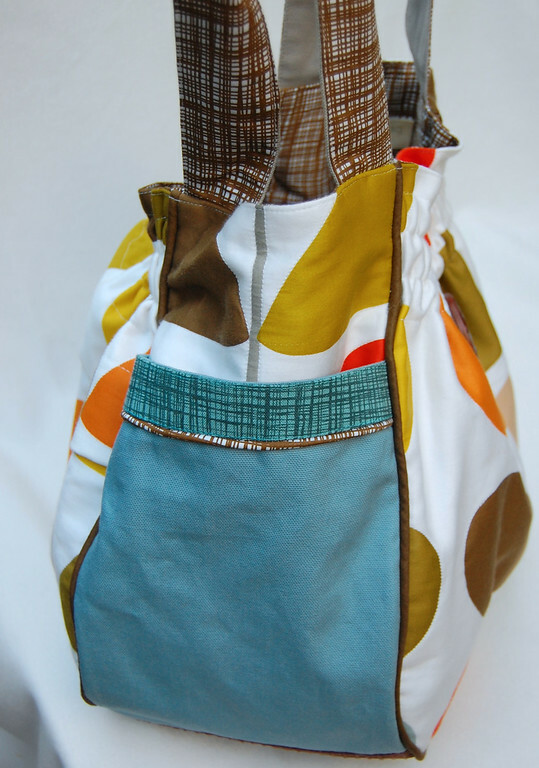 You could even use sew-in interfacing, although not for the Bella Bag, since interfacing won't work with the gathers. Well, let's move on! 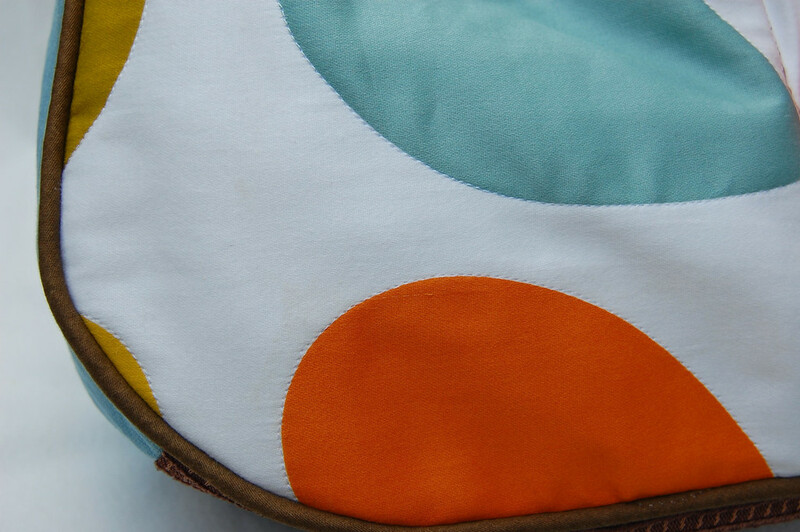 Let me show you something I really like about this bag: the textured base! It feels like what the straps look like- all scribbly. See? I'm not selfish. I made you one, too. one of which has that hidden strap with a swivel hook for your keychain, just like mine. And there's that big back pocket. 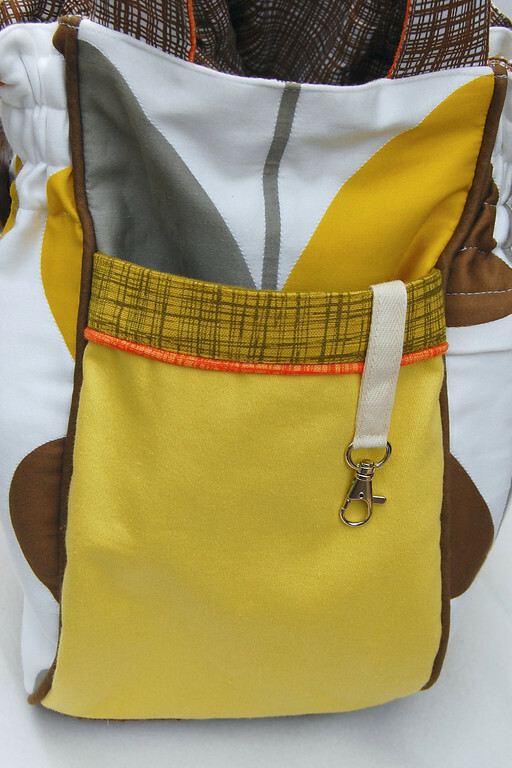 Your straps are backed with orange, to match the piping on the side pockets. It makes me smile, this bag. Because now, this is my favorite Bella Bag. 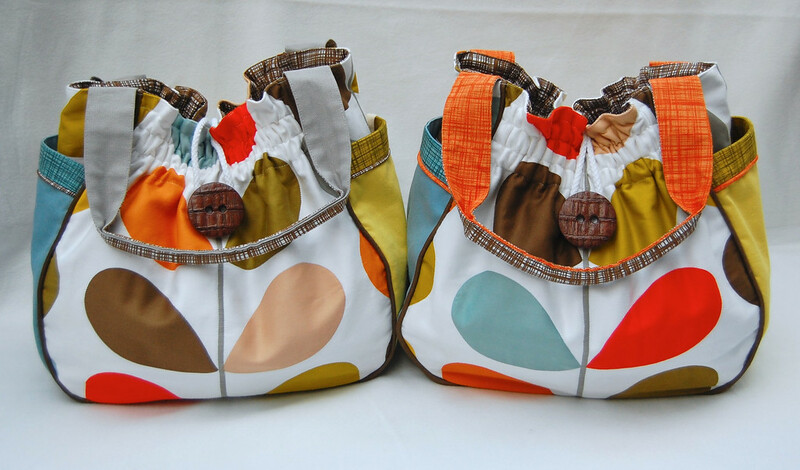 I am aiming to get the Bella Bags in the shop by Labor Day. And I am thinking of auctioning this Stem Bella rather than just putting it in the etsy shop with the other Bellas. I can think of many, many worthy causes that could benefit from an auction like this. So I have a couple of questions for you: if I list it on ebay rather than etsy, do you have an ebay account to bid with? If not, would you be willing to open one just to bid for this bag? And finally, a pattern update: Stage 2 testing is done and I am planning to work on the pattern this weekend to get it ready for you! Meanwhile, you can see Grandma G's Bella here, which she made from the alpha version of the pattern. It is beyond gorgeous. Hurrah for Jessica Jones! 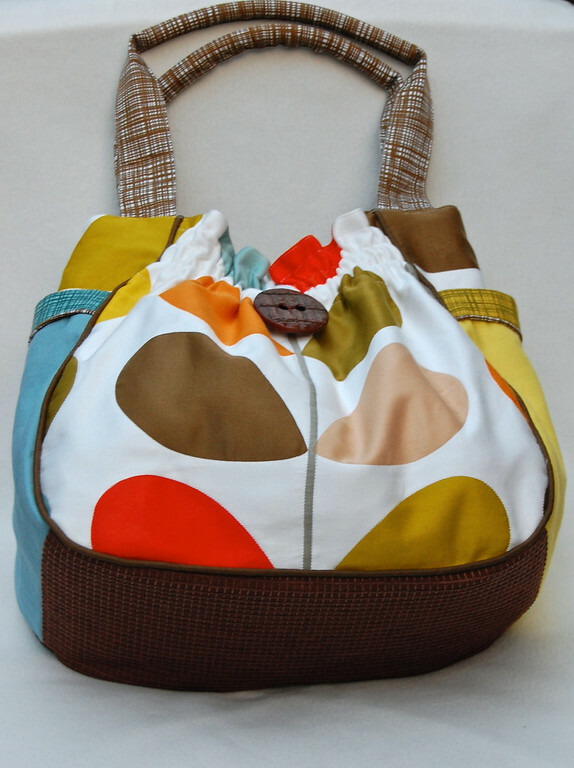 More photos of her bag, plus her review of the pattern coming later on her blog. Absolutely love it! Can't wait for the pattern! I need practice making bags. 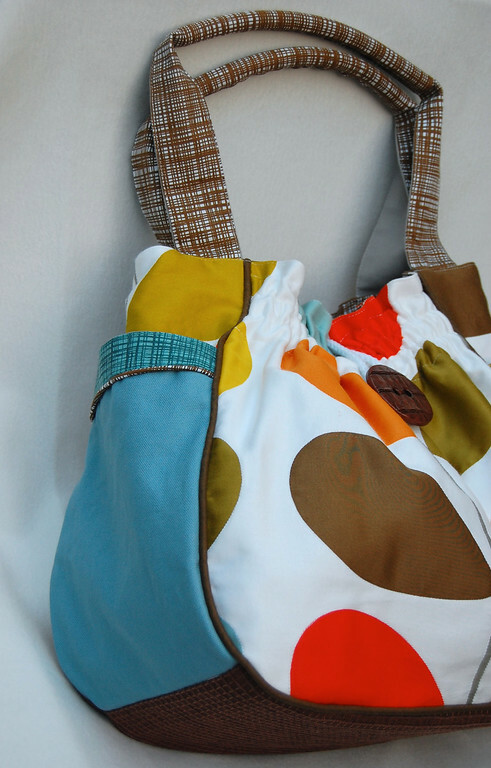 oh wonderful, i love these bags, the piping makes them very special! Because you are polling, I do have an eBay account. But to tell you the truth, I've never done a bid. Call me behind the times, call me risk adverse...I know you'll get a top dollar donation going with this one! Thank you for sharing your wonderful ideas with the world you truly are a generous person. I am sure people would bid for your bag on ebay I will start the bidding! I have made some of your designs and I look to you for inspiration every week. My children are all grown up but I have a grandchild whom I love to make things for. Thank you again for your inspirational pages. Oh.My.Word!!! I didn't think you could make a bag gorgeouser than the last one, but you did it, girl!! And TWO of them, to boot! I'm tempted to bid on that one myself! That looks like a very funcional and beautiful bag. Great fabric choices! Yes, I have an ebay account. I would try to bid for it, but I never seem to win auctions. Oh my goodness! 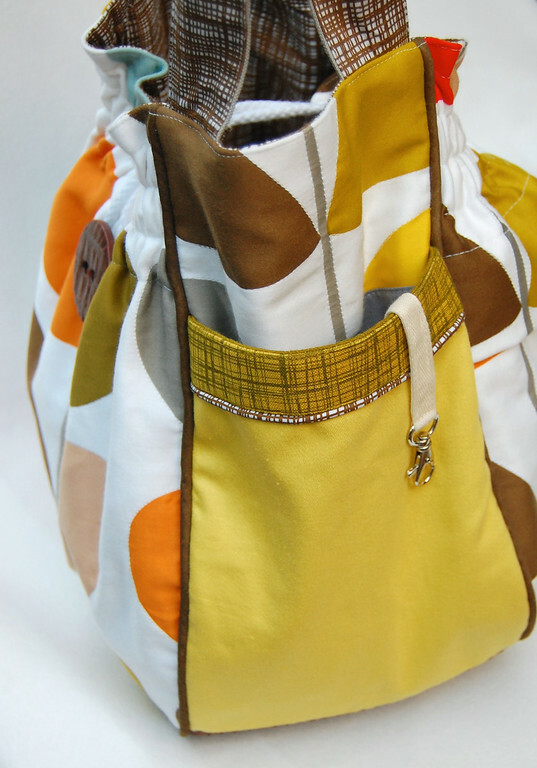 You've got to get the pattern for this bag out soon!!! I love it love it! Can't wait to make one for myself! Your fabric choices are awesome. Definitely a keeper. OH MY! Gorgeous!!! Not going to lie, I was completely bummed out when I read you were keeping it. Though I completely agree you deserve to have this gorgeous-ness to tote on your own shoulder, I've secretly been coveting the Orla Bag pre-assembly. SO it only makes it that much sweeter to read that there are two!! YAY! Yes, I'm ready to begin bidding. Thank you so much for the twill-backed and quilted idea for reinforcing quilting weight fabrics. What a great idea!! Also I can't wait for the pattern. Amazing! It is wonderful! I'd love to bid on the Orla bag, but I'm pretty sure I'll get out bid (not cause I don't love it, but because I just won't let myself spend too much on bags). So I say do it! 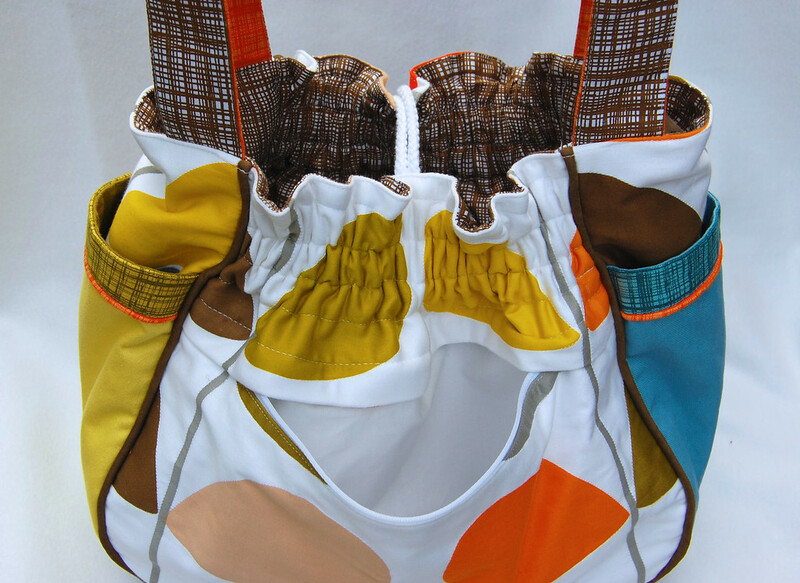 You would not be happy with me, I just finished up a bag that I made with a sateen, stretch bottomweight. Gasp! When I was buying the fabric I knew you would shake your head, but I was determined. And the lining fabric was lined with QUILTING COTTON!! I know! But I did interface the lining with fusible fleece, which has worked quite well, and it's supposed to look somewhat slouchy. I'm really happy with it, so I think I made acceptable fabric choices, but normally I'm with you. I discovered this Etsy store (http://www.etsy.com/shop/tippythai) and I'm in love with her aesthetic and decided to try my hand at a lookalike of this bag (http://www.etsy.com/transaction/92451026). I love the way your bag turned out, and I do have an ebay account. And I would be happy to publicize the auction; I know you would choose a lovely cause. u r always the best!!!!! I think it's just breathtaking!!! Beautiful design and fabric. By the way, you would probably like Marimekko fabrics. They are Finnish, I think, and I just love them! Well, congratulations again on such a wonderful job. You should have made yourself a bag long ago! Those receipts, pens, glosses or chap sticks, snacks, hot wheels/little pet shop animals/small characters or other desired item of the day need to be carried in a pretty bag. 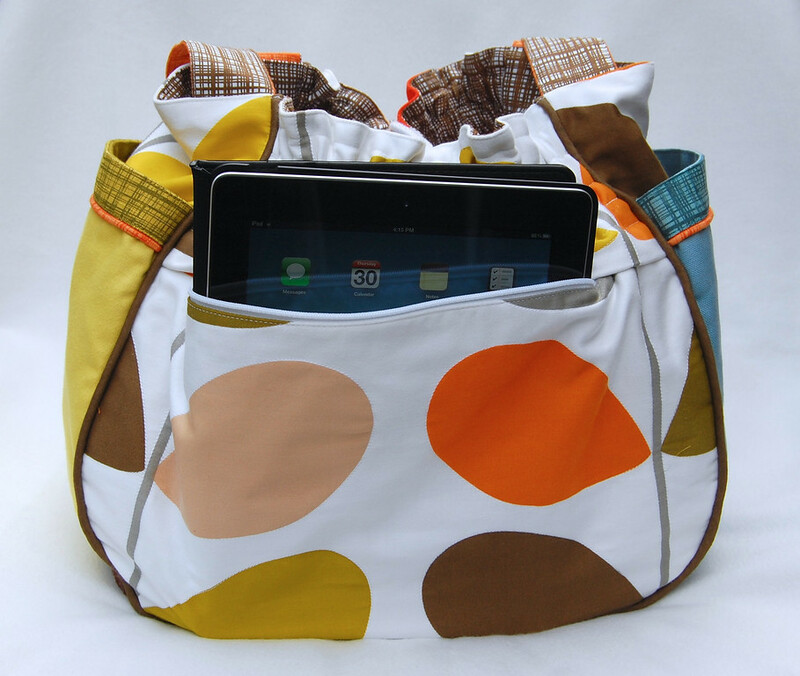 Imagine now your free advertising just by carrying your own bag! 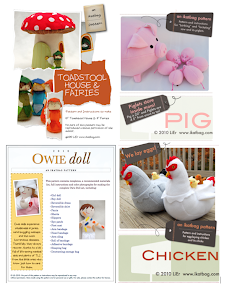 Good luck to your auction, sales, and pattern making! All are very gorgeous. Thank you for all of your wonderful posts. 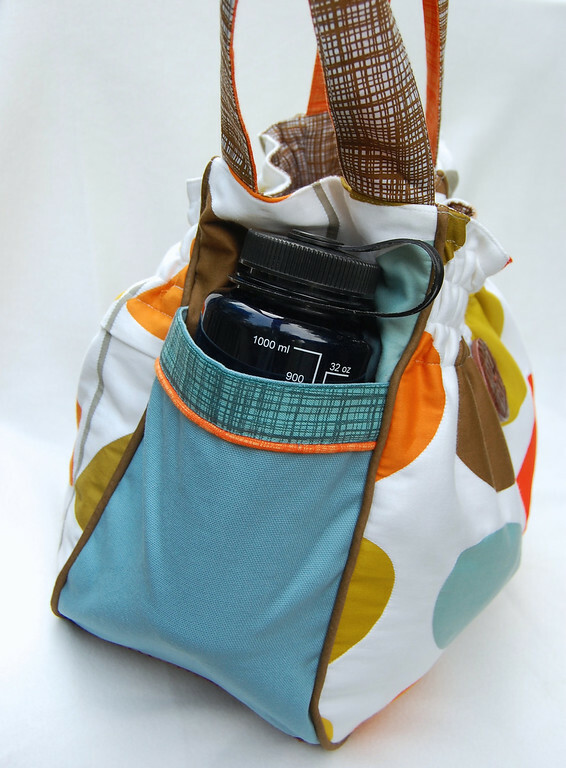 Your messenger bag tutorial was especially helpful recently. Your new bag is brilliant. Gorgeous. Yes, I have an ebay account. I've bought a couple of sewing machines that way. 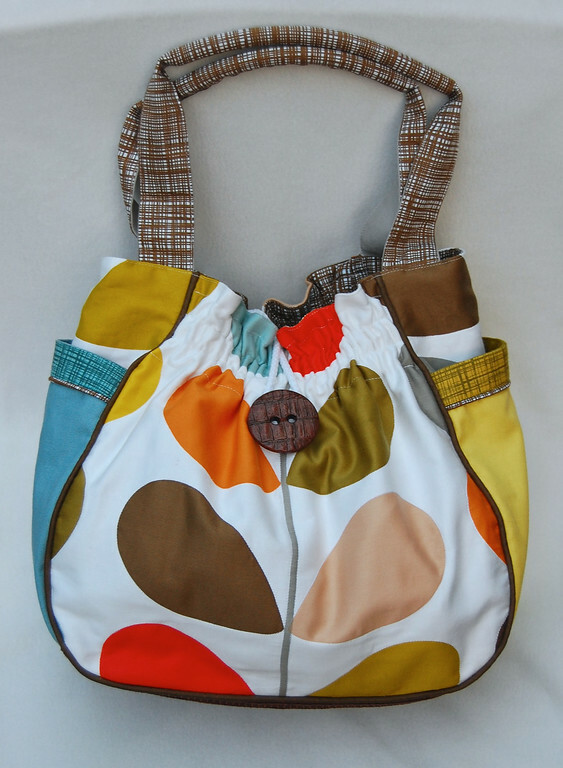 Love this bag but have so much fabric in my stash am waiting for the pattern to make my own. Your colour combinations are fantastic. No eBay account and while I am tempted to open one to bid, exchange rate would prob make too expensive - sigh. I would bid on that bag in a heartbeat! I really want it!! Do it! 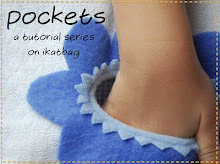 In preparation for the pattern, can you give approximate fabric requirements? I think I need to start quilting. 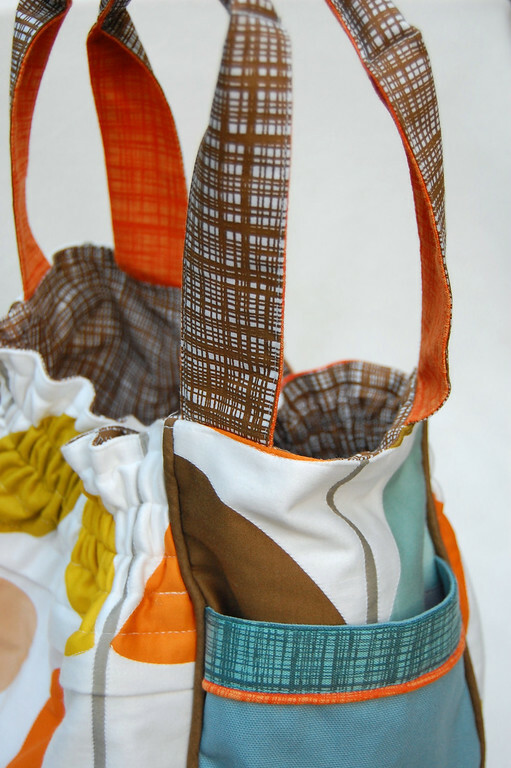 Ulrike: It depends on how many fabrics you want to use in the bag. And also the print/ repeat distance of the fabric. Ballpark figure, assuming you are using just one fabric for the outer and one for the lining, would be a whole yard of each, maybe a bit more (depending on the print etc). 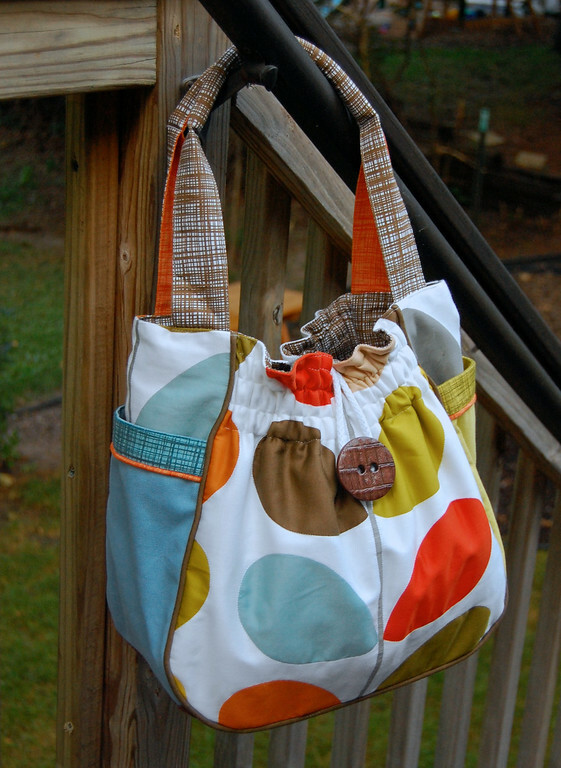 Less, if you are using several fabrics, like I did in this bag - I re-counted, and it was actually 13 fabrics. There are also other, not-visible (hidden) fabrics you will need for the pocket facings, pocket linings and the inner layer of the base. 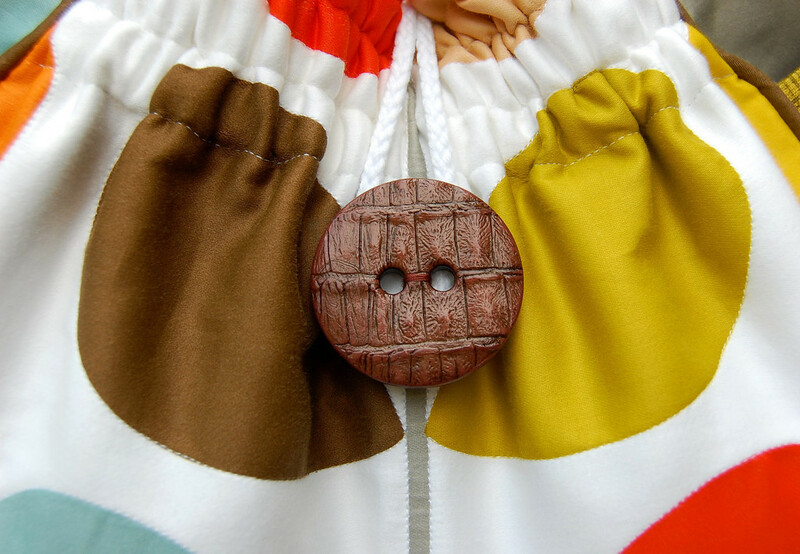 If you used the same cotton fabric for these hidden features, you'll need about a yard. So three one-yards, to be safe. I would definitely bid on that bag, and would be set on winning it!! I am in love with it! This Orla bag is fabulous!! Let the bidding begin! I love the Bella bag and bought the pattern. My problem is this: I currently live in Bangkok and translating "Home Dec Weight" is into Thai is beyond my skills :) Also, I'm kind of inexperienced, and can't quite tell by touch. So, is there a quick rule of thumb to see if I'm buying the right weight of fabric? Like: "the fabric should stay up and not flop over when held 1.5 inches away from the cut edge"
Limescented: Um, home dec isn't a very stiff fabric. I'd say that it's thinner than canvas but thicker than normal cotton. And certainly thicker than bedsheets. It's the kind of fabric people use for fabric sofas (especially those sofas that are floral) and curtains, if that's any help. You just made my day. I bought the Bella Bag pattern and made one for a gift. But I haven't been able to find home dec fabric I like for me. I keep finding quilting cotton I like. I am going to try this quilting with the twill. Thank you!